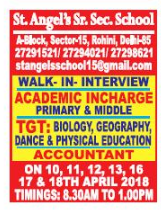 St.Angel's Sr Sec School, Delhi has advertised in THE HINDUSTAN TIMES newspaper for the recruitment of TGT plus Academic Incharge jobs vacancies. Interested and eligible job aspirants are requested to appear walk in on 10th to 18th April 2018. Check out further more details below. About School: St. Angel’s strives to stand for quality education. School has a great role to play for future. We work to bring about the appropriate restructuring the schooling synchronizing the globalized cognitive situation. Natural curiosity of the lear ner, enjoyment in exploring and observing are promoted very tenderly.